Did you know that March is National Craft Month?? 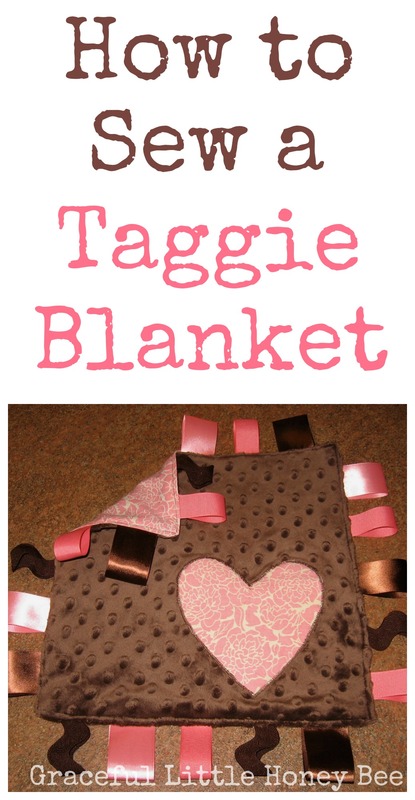 To celebrate I’m sharing a fun new Taggie Blanket Tutorial with y’all! You can purchase all of the crafting materials for this and many other projects at Jo-Ann Fabric and Craft Stores. They make crafting easy during National Craft Month with a $5 off $25 or more purchase coupon and a spring crafting inspiration website. First, cut ribbon pieces to around 5″ each and pin folded in half to right side of one piece of fabric. You will match the edge of the ribbon to the edge of the fabric so the folded part of the ribbon is facing inwards. Next, baste stitch 1/4″ over all of the ribbons and remove pins. If you are doing an applique you will need to complete that before the next step. You can refer to my applique tutorial for more information. Once project is turned right side out pin opening shut and stitch along the edge of project all the way around. Now you have a beautiful handmade taggie blanket! This tutorial is part of the Jo-Ann Fabric and Craft Stores National Crafting Month campaign. I received compensation for this tutorial, however, all ideas and opinions are my own.